Under the bright hot lights Jamie Erdahl is cool, calm, and collected. With the confidence of a seasoned vet, the 22-year-old peers into the camera and welcomes viewers to Eye on the Eagles. The half hour television show on American University athletics has been hosted in the past by smooth-as-ice professional sportscaster Al Koken ’74, and nationally renowned sports journalist David Aldridge ’87 also has contributed. Now, a spirit of partnership between the Department of Athletics and School of Communication’s sports communication course has opened the door for Erdahl to add one heck of a line to her résumé. Erdahl grew up a rabid sports fan in Minneapolis, and played basketball and softball at St. Olaf College in Minnesota. 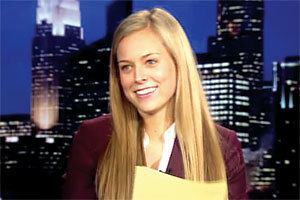 But in order to pursue her dream of becoming a sportscaster, she transferred to AU. “I had to give up playing sports in order to be in a city near more media outlets,” said Erdahl, who’s scheduled to graduate with a communications degree in December. As a junior she interned for associate athletics director, communications, Nancy Yasharoff. A former member of the Washington Capitals’ public relations office, Yasharoff regularly speaks to SOC professor Meredith Geisler’s sports communications class, which Erdahl is taking this semester. Yasharoff was struck by Erdahl’s potential, and asked her to host Eye on the Eagles, which airs on Comcast SportsNet. Erdahl quickly adjusted to the teleprompter, and the shows went off without a hitch. That’s precisely Geisler’s aim in her class. This semester her students are working with the athletics department to develop promotional ideas for a new mobile app the department is preparing to launch. One of those speakers was Billy Stone ’86, ’89, an executive producer at CBS College Sports Network. He met with the class following the March 2 AU men’s basketball game and has given Erdahl advice about embarking on a sports broadcasting career. Erdahl may follow that path, but first she’s stopping in Bristol, Connecticut. This summer she’ll work as a studio production assistant intern for ESPN’s SportsCenter and Baseball Tonight, and with internships at Fox and NBC affiliates in Minnesota already under her belt, Erdahl will enter the job market with a wealth of experience. For Jamie Erdahl, these days that doesn’t sound like much of a joke at all.